I'm sitting in my office looking out at the blustery weather and loving that I am inside in my cozy home w/ my husband. . .I bribed him into working from home this afternoon. :) I didn't sleep very well last night because every position I got into felt like it was pulling or squishing. . .it just felt weird. Low and behold, I am tired today and so glad it's Friday! 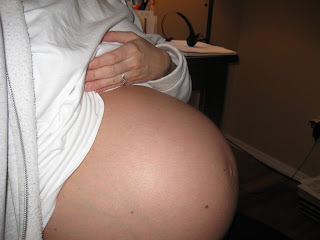 Seems like everyone is asking for tummy pictures so I took one and had Zach take one--he was not too happy about it, he doesn't think its appropriate for people to look at my bare belly. . .I LOVE showing it off though because it is just so amazing to me and I think people's reactions are fun. His pic-please don't look too closely, I have no make up on and am basically in my PJ's/work uniform. :) My pic--makes the tum look even bigger because I had to be so close w/ my arm stretched out. . .and Abby does look bigger when I'm sitting down. She's been moving so much lately. Sometimes it is a shocking feeling but most of the time I absolutely love it. I wonder what the heck she is doing in there. According to my baby journal today starts my 9th month but since my due date isn't til Dec. 10th--not totally sure how that works out. . .regardless, I'm on the home stretch. Zach and I have gone to 2 birthing classes and have 3 left. They make me a bit anxious for the whole labor thing but I know we will do fine. . .
Last weekend all 6 Hussey siblings got together to just hang out. 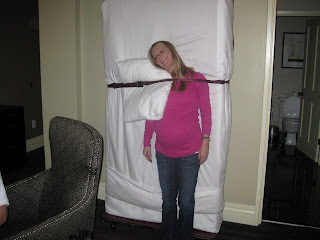 We stayed at the beautiful Alexis Hotel because they have some huge rooms. . .and I just love it there. We didn't do much. . .tried to eat dinner at Red Robin but 48 kids from Sumner Highschool rented a party bus to Seattle for dinner and got seated before us!! Some of the gals were wearing dresses that Abby will definitely NEVER be allowed to wear. . .wow! We were hoping to get seated and served quickly because we had a few people quite anxious to get back and watch the Husky game so we left and ordered room service. It was yummy! 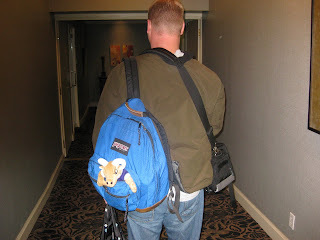 We watched the game, talked, acted like geeks and ended the little get-a-way with breakfast at the Library Bistro. When Kyle was getting ready to leave Sophia gave him the NT Ram doll to take so we had one extra visitor hangin with us. :) Kyle, Kora and Michelle rode the train up and Kyle had a REALLY good time at the drink cart. Total chatty Cathy when I picked them up, it was hilarious. Kora and Marisa, aka-The Little Girls, slept together. 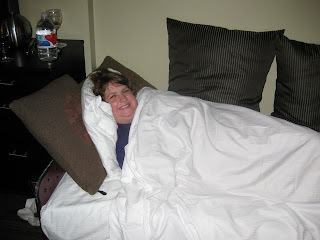 Michelle slept on the comfy roll away. . .which we used as seating while watching the game--it came quite in handy! The dorky boys--I don't know if you can see it but they thought it would be funny to put earplugs in a certain spot for the pic. Look closely. Kyle also had his night gaurd on so that was awesome! :) And where did Abby and I sleep??? Actually, I didn't sleep standing up. . .I took the couch because I knew no one was going to want to sleep w me tossing and turning and getting up to go to the bathroom every 5 seconds. The couch is actually a comfy place for me to sleep because I can lean against the back and stuff a pillow under my belly etc. Lastly--I had to throw this pic in. 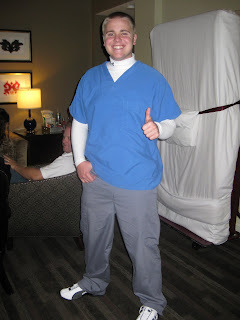 :) Joe is a student at a Dental Assistant Program at my Uncle George's. He has to go up to Smokey Point every Thursday and Saturday til January I think. He is contemplating eventually being a dentist so my parents thought this would give him a good idea of what to expect. He loves it! He was the patient last Saturday so the other students had to practice putting dental dams on him. One gal totes cut his gums so he was a little sore. Some day he could be your dentist!! Thanks Michelle for getting us all together--it was sorta her idea to do this. It was really fun. I love you guys! I had my 32 week doc appointment today and everything is going great. My blood pressure was 100 over 60 which the nurse said was excellent. Abby's heartbeat sounded great and I asked the doc if she is able to tell how big our little girl is. . .she said she can give me an idea as we get closer but it's a little hard still at this point. She did say she is still measuring me a few days ahead of schedule. . .Zach is a bit worried about this since the last home Husky football game is Dec. 3rd (my original due date). :) Abby will probably decide to have her birthday that day because he is thinking about it so much, just like how my mom's water broke w/ Joe on our way up to the Bellermine basketball game. hee hee Doc also said she thinks Abs has moved and is now head down--we'll see. She has been moving quite a bit so I wouldn't be surprised. . .let's hope she stays that way. I do think she is sitting on my bladder--every time I walk, I have to be very careful because it feels like I am going to pee my pants. Abs and I in all our glory--side note: Zach was laughing while taking this pic because I am getting so big. Real nice. :) It was my night to make dinner and I made spaghetti so I put this apron on which my mom gave me at my bach party with a note that said "sometimes it's fun being in the kitchen with nothin but your apron on"--ummmm, not sure this is the time to do that. :) Another side note: Zach chuckled when he came home and saw me in this apron. . .especially because there are pearls attached to it. I can't quit thinking about Baby Abigail's arrival. I am getting so excited to meet her that sometimes the thoughts consume me. . .it's horrible when that happens during the middle of the night. Christmas is going to be so fun this year with a new baby! Zach and I went on our annual Fall Drive today to go get pumpkins and take pictures of the beautiful fall foliage. 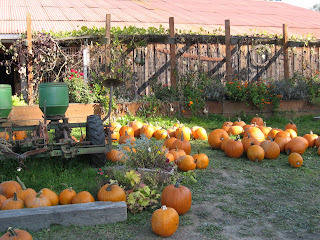 There is a cute little pumpkin patch in Fall City that we went to last year. They have homemade donuts, a band, horses, hay rides etc. . .There were quite a few people there so we just walked around but didn't actually get any pumpkins today--the line was so long! It was just fun being out in the sunshine and enjoying the scenery. 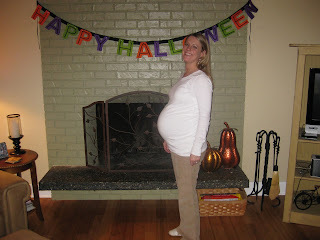 In the pic above of Z and I, I think there is really a pumpkin under my shirt. 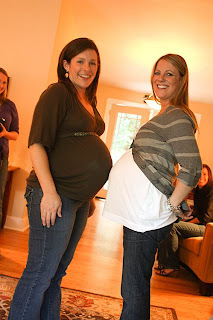 :) I decided today that I need some long sleeve maternity shirts and one more pair of pants-either another pair of jeans or some cargos or something as these ones are getting uncomfortable and I have 2 months to go. . .well, everything is getting uncomfortable-I'm getting huge! The cute smaller pumpkins. . . 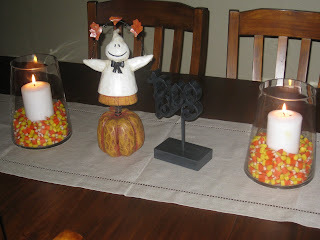 I also decorated for October/Halloween this weekend and this is what is on our table. I love it. 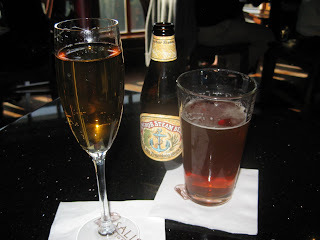 We ended our drive at Salish Lodge in "The Attic" which overlooks the Falls. . .they had sparkling cider so I actually got to drink a festive fall drink w/ Zach. In the link to the right of our drive you will see some pics of my glass-the bubbles formed a little heart and I thought it was really cute. 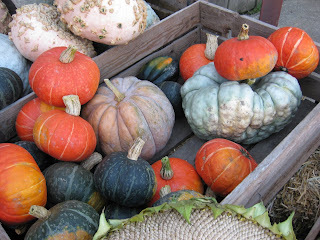 The gourds are so odd but have the best assortment of colors. 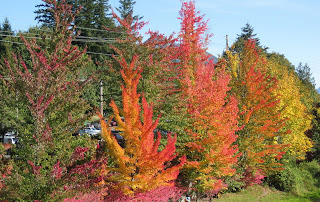 The "electric" trees near Salish Lodge--can the colors get any prettier? I love this transition period from summer to fall when the colors are so vibrant, there are still leaves on the trees and the sun still shines. It was a gorgeous day to be out in the country driving around. . .I can't wait to have a little one to take next year! 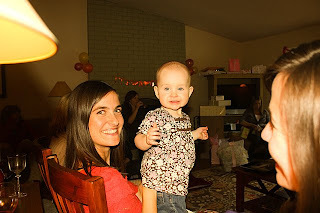 On Saturday my sisters, Mom and Leah hosted a baby shower at my house for Abigail. It was wonderful. 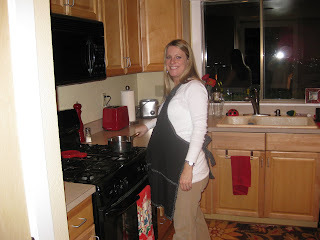 Zach and I had been working on lots of home projects preparing for the event so we could show off baby and our house. Everyone got to see Abigail's room which was really fun--we still have a few things to do so once its done, I'll post pics. Here are some pictures thanks to Marisa of the fun day, in random order. :) Thank you everyone for coming and for the beautiful gifts. . .they are so appreciated and loved! Trying to get Abs to move--I feel her all the time but she sometimes gets shy for others. 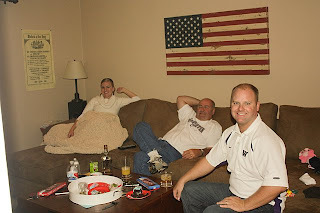 :) The UW crew downstairs watching the game--I think they got louder than us! Pregers x 2! 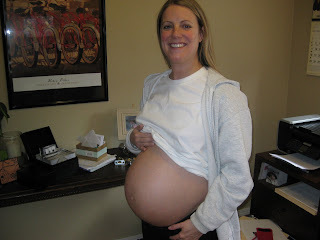 Malia is one month ahead of me w/ her 2nd baby--She doesn't seem that much bigger than me. . .I think she looks great!! Grammy trying to talk to Abby to get her to move. . .I think she stops when she hears a new voice--trying to figure out who the heck that person is. Leah, Sophes and I. Sophia is dressed up as a mermaid or princess I think w/ her pink sash. She really wanted to get in a pic w/ us. 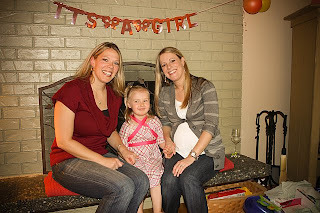 Before Sophia joined us--BFFAE's. . .it was so great having Leah join us from MT!! The next time I see her, baby will be here. So crazy Hello Miss Gwen--this little girl has the prettiest eyes and happiest smile. Love it. 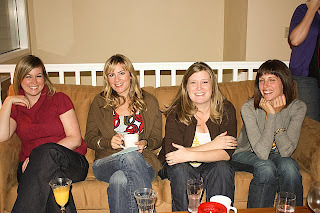 Some of my book clubbers, sorry Molly that we got a shot w/ your eyes a little closed but I still thought it was a cute pic. 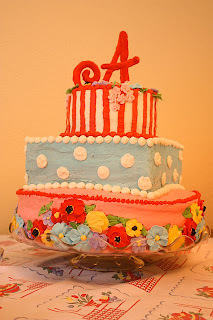 Love my BC girls The CAKE thanks to Amy. . .she was inspired by Abby's bedding. She did a truly amazing job on this thing and managed to transport it all the way from Tenino-low and behold, I think she was ready for a glass of wine when she finally arrived at my place. Thanks again Amy for a beautiful and yummy cake. See more pics of the day at the link to the right. 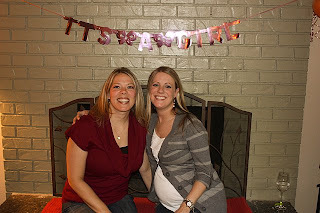 I still can't believe there are only 2 more months to go before we meet Miss Abigail. Thank you again to everyone for everything. As I always say--I have the best family and friends anyone could ask for.